Right in the heart of the Walpole Wilderness area, close to Walpole townsite, a host of local scenic attractions and nature at your doorstep. Walpole Wilderness Resort was established in 1998 on a privately owned rural property of 170 acres of Karri and Tingle forests, just 15 minutes north of Walpole, on the South Coast of Western Australia. Each chalet has been designed so guests can appreciate the most magnificent panoramic views while maintaining their privacy. Enquire today to enjoy your ultimate wilderness experience. Nature On Your Doorstep Walpole Wilderness Resort is also located in the middle of the newly proclaimed Walpole Wilderness Area, a huge 378,000 hectares of Western Australia’s southern forest. This is an important part of an international biodiversity hotspot, home to threatened plant and animal species and others found nowhere else in the world. Walk trails have been designed for exclusive use of our guests and take in some of our 170 acres of rare Tingle, majestic Karri and native wildflowers, from a short 1 to 5km walk. Enjoy the Comfort and Tranquillity Walpole Wilderness Resort has been designed for the discerning guest who appreciates comfort, style and country charm. In the main bedroom of each cottage there is a private heated spa with forest views and an ensuite shower. Our chalets are perfect, whether a romantic escape for two or that family getaway. These self-contained cottages have been built by craftsman with extensive use of timber including polished jarrah floors, jarrah rafters and pine ceiling linings. All cottages are located to provide guests with the best views while maintaining privacy. On warm balmy evenings imagine lighting up the gas barbecue and watching the resident kangaroos and birds while you enjoy your meal on the spacious verandah. Located only a short distance from the charming town of Walpole, the cottages are within an easy drive to the famous Valley of the Giants Tree Top Walk and other local tourist attractions. 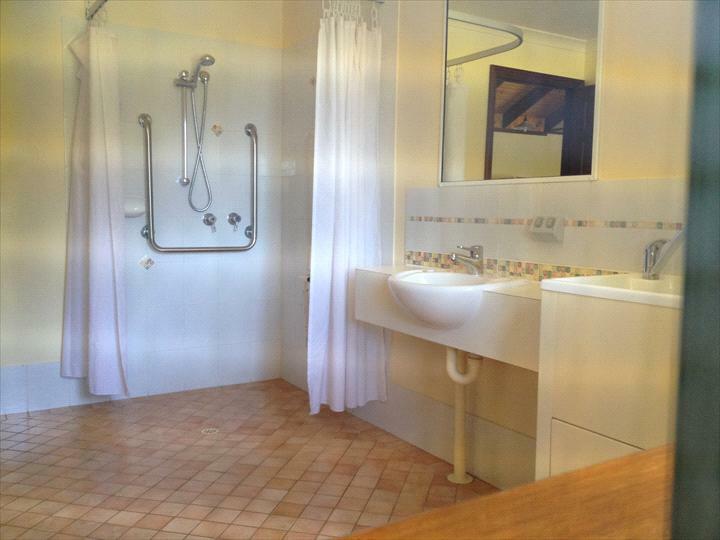 Three Bedroom Self-Contained Cedar Cottage. The main bedroom has a queen bed, private heated spa & ensuite shower with forest views. The second room also has a queen bed and the third bedroom has two single beds. The kitchen is fully equipped with comprehensive cooking facilities including a gas stove/oven and a large microwave oven. Linen including towels, and cosy warm doonas provided. Although the chalets are set up for 6 people we can supply a fold a bed, linen, towels etc, for a 7 person. Three Bedroom Self-Contained Cedar Cottage. The main bedroom has a queen bed, private heated spa & ensuite shower with forest views. The second bedroom also has a queen bed and the third bedroom has two single beds. The kitchen is fully equipped with comprehensive cooking facilities including a gas stove/oven and a large microwave oven. Linen including towels, cosy warm doonas and lovely fragrant soaps provided. This cottage also has disabled access. All cancellations will incur a $55 administration fee. Bookings cancelled within 48 hours or less before check in time will incur a cancellation fee equal to one night’s tariff.